The Daily Cookie - 365 Tempting Treats for the Sweetest Year of Your Life by Anna Ginsberg is wonderful collection of cookie recipes that would make a good gift for yourself or a wonderful birthday or holiday present for the baker in your life. I was enthused about this cookbook with it's full color photos and all the cookie recipes. Many of those recipes are based on traditional favorites, some are old fashioned cookies, some are based on other classic desserts in a cookie form. Then my daughter saw it, and she loves it even more than I do. She's been reading it for pleasure. Each day has a specific holiday or event listed, and sometimes the cookie recipes are themed for that holiday. November 11th, Veteran's Day features lemon rosemary shortbread because rosemary is for remembrance. Those sidebars frequently have a bit of information about the holiday, and sometimes other events that happened on that day. That's the reason I think this book makes a great gift. Those little sidebars with an event for each day are charming and interesting. The cookie recipes are great, they cover a really wide range of tastes, textures and types. Bar cookies, rolled cookies, shaped cookies and drop cookies. If you're stuck in a cookie rut of using the same recipes over and over (for me it's snickerdoodles and chocolate chip cookies), the variety will inspire you. There are fruity, chocolates, nutty, vanilla, candy, buttery and other flavors. The other thing that makes this cookbook a stand out single theme cookbook is the various indices in the back of the book which list the cookie recipes by batch size, pan size, cookie type and even how easy they are to make. There is also a more traditional index by recipe name and flavor ingredients. The instructions are written in American style volume measurements, the end of the cookbook does has an equivalency table for people using metric which also includes Fahrenheit t to Celsius conversions and lists British gas marks. This book does consider brownies to be a type of cookie and there are several brownie recipes for the people who love chocolate. 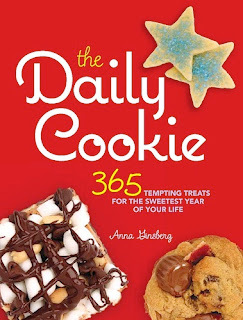 My daughter is simply charmed by this book, it's not just the cookie recipes, it's also the events and layout. I like the fact it has so many great cookie recipes that can quickly become family favorites, and that the recipes and instructions are well-written and easy to understand and follow.